Aerators are often used in retention ponds today, and there are several reasons why they’re now more popular than ever. Your retention pond will not only look more attractive with a spray fountain, it will also help your pond or small lake to function better. Below, you’ll learn the main benefits of having an aerator for retention ponds and lakes. One of the main reasons that having a water fountain in your pond is so beneficial is the oxygen. 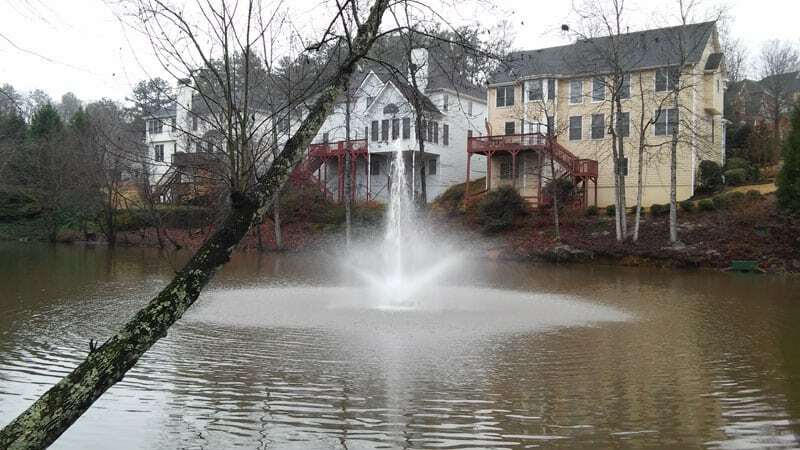 Aeration with a spray fountain agitates the water, which means that more oxygen is spread through the pond or lake. Your plants and your fish are healthier and happier when they get plenty of oxygen in the water. Healthy and well-oxygenated plants mean that your fish enjoy a constant healthy food supply, and that leads to better fish health overall. Well oxygenated water is particularly good for warm water fish. It’s common for warm water fish to fail to thrive if there’s not enough dissolved oxygen levels, and the aerator can ensure that there is plenty. When your pond or lake ends up having different temperatures at different layers of the water, it’s known as stratification. This is never a good state for your water, and it can potentially harm fish if you don’t resolve the problem. If your pond is not properly maintained, you may need to perform pond cleaning and maintenance. When you have an aeration system in your retention pond, the water will be agitated and circulated continually. This prevents the water from settling into layers and allows for a constant temperature throughout the pond. Your water quality depends on several factors — and your pond plants are in control of one of these factors. If your water is lacking in oxygen, plants will not only fail to thrive but will also start to expel substances that cause major water quality issues. Before you know it, you could have serious pH and alkalinity issues. Fortunately, a water fountain can provide sufficient aeration to keep the plants — even the ones at the very bottom of the pond — satisfied with their oxygen levels. You’ll get cleaner and better water quality with less effort when you have an aeration system in your lake. Need Aerator Help for Your Retention Pond?